Lighting is often thought of as being a simply functional part of our home, but many light fixtures can serve as a work of contemporary art. Intricate shapes, clean lines and bright or soft illumination create awe-inspiring looks that become a fundamental piece of a room’s design. Whether it’s to create a decorative statement, provide focused, task-oriented illumination or add ambiance with warm, general light, lighting is necessary to any space and to your day-to-day functions. With the just the right light in place, you can transform a room from a casual setting to one that is rich in style and design. Whether you’re using it as a decorative element or as a purely functional source of illumination, lighting can—and should!—be found in a number of areas of the home. The dining room is the perfect space to grace with an elegant chandelier hanging above the table, whereas the kitchen might be better suited for an assortment of mini pendant lights or island lighting to add some style to the room’s design. Another often-overlooked addition to kitchen lighting is a proper under cabinet lighting system, which brightens countertops and makes for easier food prep. In the living room, part of creating a comfortable gathering area is the right combination of floor and table lamps and track lighting to accent specific areas of the room. 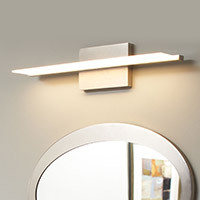 Bathrooms benefit from the addition of wall sconces and bath light bars, pairing with natural light sources to provide ample illumination for everyday tasks. 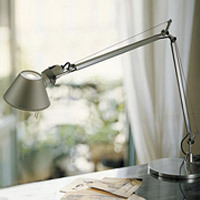 In the home office, productivity gets a jump start with the perfect modern desk lamp and in smaller, low-ceiling spaces like closets and hallways, consider recessed lighting or flushmounts. 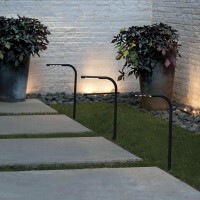 Finally, keep your deck and patio well-lit with the assortment of outdoor lighting available. From sconces and flushmounts for the front porch to path lights that help with dim areas of the backyard, you'll find everything you need to ensure the exterior of your home is properly illuminated. From traditional homes with classic pieces of décor, to luxurious homes begging for a crystal chandelier, to casual and contemporary spaces, there’s a light for that. In exceptionally modern homes, look to clean-lined chandeliers and pendant lighting as statement-making designs that will have guests staring at the ceiling. Casually decorated homes can be suited with a mix of functional fixtures like flushmounts, sconces and recessed lighting, while transitional homes benefit from a combination of casual and contemporary fixtures. 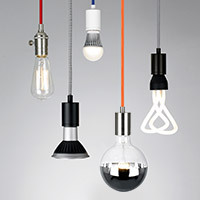 You will also find a number of lighting designs to fit specific decorative themes including Scandinavian design lighting or retro-inspired, mid-century modern lighting. And if you enjoy the benefits of energy efficiency in your home, you will want to see the collection of eco-friendly lighting made from recycled and sustainable materials, as well as fixtures using the latest in LED technology. With a substantial range of sizes, shapes, finishes and colors to choose from, selecting the right lighting can be an overwhelming decision. 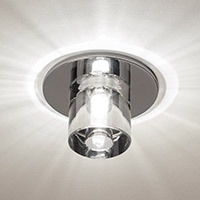 You first need to determine the function of the lighting you need: is it for general light in dim areas of the home, or do you need focused, directional lighting to aid you in certain tasks? Once you identify why you need a light fixture, then you will want to measure the space where it will be placed. Review the sizing dimensions of the lighting you are interested in to best gauge its height, diameter and weight. You should also check out the required bulb type for the fixture to ensure you are prepared with the right set of light bulbs. If you’re working on a project for one or more rooms, in the house, look to our recommendations in these helpful lighting planners for a number of great ideas for the kitchen, dining room, living room and more. If you have any questions about the lighting featured here, please call our experts at 877.445.4486. 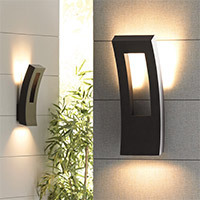 Set the mood with your lighting by placing it on a dimmer. 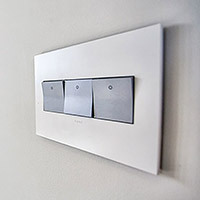 Light dimming switches and controls are easy to install and are available in a wide variety of gang sizes, colors and styles to accommodate your existing decor and switch configuration. 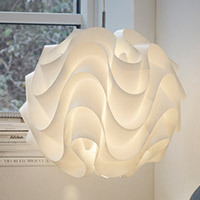 You will also want to pair your lighting with furniture that brings your style full circle. Our collection of modern furniture includes a variety of table and chair sets for the dining room or kitchen, sofas and lounge chairs for the living room, outdoor-friendly furniture and much more.